One of the best features of WordPress is its plugins feature and after moving to WordPress I’ve collected so many plugins. Some of these are very useful and handy that I will share with you. In this post I’ve listed 11 best comments related plugins. You must use these plugins to make your WordPress blog more user friendly. Top commentators Widget is the must have plugin for any WordPress blog to receive more comments. This plugin also helps the commentators to receive a link back from the blog for some days. Subscribe to comments plugin helps your visitors to sign up for an email notification of subsequent entries. It also provides options for commentators to unsubscribe to certain posts, block all notifications, or even change their notification e-mail address. This one is one of my favorite plugins. You can show love to your commentators by giving a link to their last blog post using CommentLuv plugin. It also helps you to get more comments on your articles. So it is beneficial for both the author and readers of the blog. This pluign enable your readers to coment quickly without leaving or refreshing the page. It enables users to reply on a exist comment, and the discussion will be displayed threaded or nested. You might have received a thankful notification after leaving a comment on some blogs. 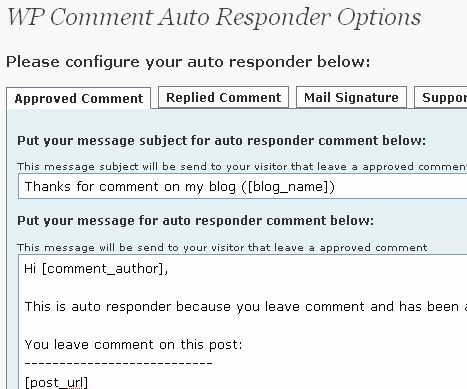 WP Comment Auto Responder does this task for you. ItsÂ the nice way to say thanks to your commentators. Its a simple yet useful plugin that allows your commentators to edit their own comments. The commentators can only edit the comment with the time specified by you. Thank Me Later is a plug-in which will automatically send a thank you email to readers after they post a comment. It can be set to send the message a time after the comment was posted (an hour, day, week, month, etc). It is effective as it will remind readers of their comments and gets them engaged with future discussion and your blog. It is useful to attract “one-time” readers who will post one comment, and then forget about your blog. This simple plugin displays a list of your blog’s newest comments. This plugin allows you to add Twitter-like @reply links to comments, including a preview of the comment replied to. When clicked, those links insert the author name and a link to the comment you are replying to in the textarea, and adds a Preview of the original comment to the @Reply. WP Twitip ID adds a field to the comment form for a user to add their twitter username. Once published, their comment will display a link to follow them on twitter. thanks, I was looking auto responder plugin but did not know its name, haven’t tried rest. Hello Simrandeep, could you please tell me what a comment plugin you are using. I like this “reply”. 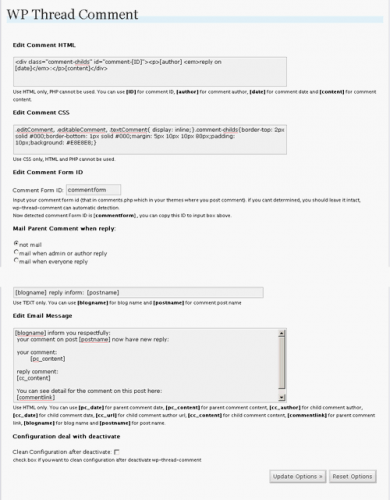 There is another plugin I used long back called comment relish [http://www.justinshattuck.com/2007/03/19/comment-relish-wordpress-plugin/]. The problem with such plugins is that they are said to consume much resources. Nice. WP Twitip ID and thank me later seem to be interesting and are new for me. Thumbs up. Good article. You need to customize your theme, specially the Header. Looks odd on widescreen. I have 3 plug-ins that you have mentioned above. I don’t think threaded comments plug-in is a must as most of the themes today come with that enabled already. It’s probably used on old themes which are not supported, just my opinion. Otherwise, a nice collection of plug-ins. Comments play such and important role on a blog or site. Webmasters must ensure that the comment section is readable and correct. But i don’t like to receive thanks mails from WP Comment Auto Responder. I feel its just killing my time to monitor all those mails 🙂 But good for new bloggers to retain the readers. The top commentator plugin can lead to comment hijacking.Ajax comment and commentluv plugin are great. Thanks for the great info! I’ve been searching for a plugin that would allow me to enable replies/threaded comments, and couldn’t quite find the right combination. Thanks to you, I’ve figured it out! BapunÂ´s last blog post..Phata Poster.. Nikla Hero! This word press plugins are really very nice,all plugins are very useful to attract the visitors, mostly i like to used top commentator and comment luv plugins because this this plug ins are attract the people to comment on the blog. yup. other webmasters usually searching for blogs that using those plugins. Will check them out soon! .-= jamir´s last blog ..DZone Trinoma: Canon Sale =-. O.K. I agree with you!THANKS! You guys do a great blog, and have some great contents. Keep up the good work. Thanks a lot for your nice article. But I had difficult time navigating through your website as I kept getting 502 bad gateway error. Just thought to let you know. Thanks for letting me know. I didnt get this error yet. I will look into the details now. I’ve been looking for a way of making my comments more ‘forum’ like in look and feel for users. Do you know if Buddy Press is any good? .-= Mindful Mum´s last blog ..Maclaren Estimate 2 Weeks for UK Parents on Repair Kit List =-. I like wordpress for its easy interface and plugin support.There are also tons of free templates there. .-= RapidshareSearch´s last blog ..Ahimsa Free WordPress Theme =-. .-= Technology Tips and Tricks´s last blog ..Download Rapidshare Files Without Limitation and Without Premium Account =-. Definitely some great ways to reward the people that comment on your site. You should also use Comment Relish. .-= Blog4Boys´s last blog ..How to Lose Weight Without Excercise =-. .-= Prateek´s last blog ..Bollywood Actors On Twitter =-. Great info! Such a nice collection of useful plugins for all users. Thanks for the post. .-= Rainbow Skill´s last blog ..Steps for sending Audio & Video signals through Patch Cable =-. These plugins offer great incentives for people to leave comments – I didn’t know there were so many! .-= Bench Press´s last blog ..Using Chains to Improve Your Bench Press =-. Try taking SEO in house and saving some money. Good old fashion do-it-yourself. It’s not hard, you just need a little guidance. .-= gadgets´s last blog ..Pull String Solar PoweredTorch =-. This is great. I didn’t know there was a plug in that would send out a thank you email to people that have left comments. I like the idea of it going out a couple days later to remind them about your blog and that they left comments. .-= Heidi Passey´s last blog ..Building A List Fast Through JV Giveaways =-. .-= SeoWiz Kid´s last blog ..What Search Engine Marketing Solution Should You Be Using? =-. Thanks a lot for your very nice list. …..
.-= Cemplon´s last blog ..Dan Kita Pun Akan Menjadi Tua =-. Guys, also be sure to check out WP Super Cache, a phenominal plugin. It creates static pages from wordpress posts to reduce CPU load. Works great! What’s the value of Comment Luv to the blog owner who hosts the plugin? .-= Greg´s last blog ..What do you think about bumgenius diapers? =-. There are so many out there. Which comment plugins are the top and most popular. As I See Most are using Top Commentator,Right! .-= William´s last blog ..The Art of Public Speaking =-. .-= Bollywood Exclusive´s last blog ..Hrithik and Barbara would have made KITES look like a love triangle but its not =-. I had been looking for nested comments and this plugin commentluv seems to be the answer, does my previous comments get deleted after i install commentluv? .-= Rakesh Narang´s last blog ..Blogging and Earning Revenues from it is a slow process =-. No, your previous comments will not get removed after installing this plugin. nice collection of plugins. I’m going to add in Top Commentator & CommentLuv to my blog tonight :-). Thanks ofr the great info! .-= TMI Leads´s last blog ..TMI Leads for Moving Companies embedded video =-. Pretty nice plugin. I will also use this. great article, despite I know most of them…well…I didnâ€™t know there was an auto responder plugin! Great share! .-= Windows 7 tricks´s last blog ..How to Turn on the New Google Adsense Beta Interface =-. I’m not 100% on this, but I do like the idea. Comment luv seems to work for everyone involved. I want to thank you for yet another wonderful article. I am always on the look-out for great WordPress tips to recommend to my own readers. Thanks for taking the time to write this article. It’s exactly what I was looking for. Truly great post. I love using Comment Luv on my sites…. I think its one of the best out there. I am looking for an ajax posting comments.but couldnt find a good one. Does anyone know if having too many plugins in your WP blog would affect SEO? It seems I have seen some of the more ranking blogs with little plugins, or widgets for that matter. Link Building is one of the most significant aspect of the off page optimization process and is a major determinant of the popularity of your site. For search engines, back links or links pointing to your website indicate that you are ‘hot’ in the online marketplace. Useful list thanks. 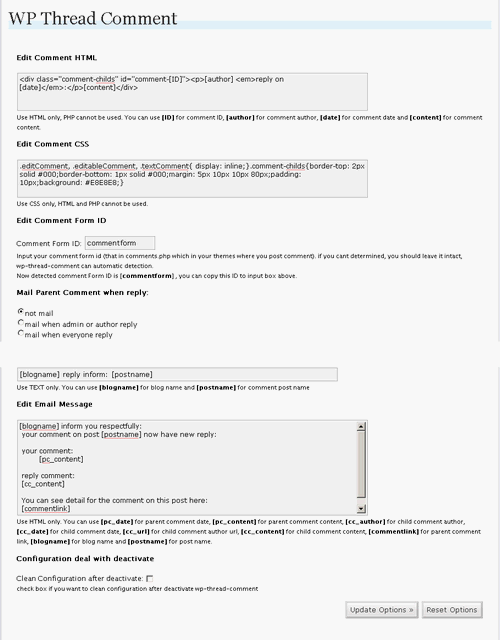 I also installed the fckeditor for wordpress plugin as this gives the commenter some control over the format of the comments. I am adict of plugins. I do not quite understand how come all these little programs are free. They are so useful. I am grateful for all the people that work so hard to create them. But still I am amazed. Many plugins have got a paid version with more powerful features, other free are just a good promotion for the programmer. I think it builds a good reputation and trust, to give some things for free! What is good plugin to stop all of the blog spamming? Akismat is the best plugin to control blog spamming. Very useful list, decided to implement Subscribe to Comments and Ajax Comments based on your suggestions. Many thanks. Great stuff – Extremely useful content! Thanks for posting your opinion. I’m using the Thank me later and the CommentLuv plugin for my blog. Does the Top Commentators Widget show the thumbnail of the commentator? Hope all of us learn from it. Thanks. Yes, it shows the thumbnail of the commentator. being a webmaster is sometimes very tiring due to the large amount of multitasking involved:*. Thanks for posting your opinion. Iâ€™m using the Thank me later and the CommentLuv plugin for my blog. Does the Top Commentators Widget show the thumbnail of the commentator? Yes, this plugin has the option to show thumbnails of top commentators. These are some great plugins. I specifically like the comment luv plugin, as well as the “thank me later one.” Really good info. i understand that but using the word press blog it is very easy to share your information. thanks. There are some great WordPress comment plugins here and I utilize some of these in the wordpress blogs I developed. Does anyone have any additional comment plugins they would like to share? hey thanks for sharing this list i was looking for it…. Hi, what comment plugin do you use? I’m looking for the same one but from the article it is not certain. Adding Customizing Smilies and Edit Comments Plugin are also a very Important Plugin. Thanks for the good list. I have been using CommentLuv on many of my sites, but will now try to use the other to see which one works best with my sites. Commentluv is just perfect! I’ve been using this plugins ever since I started blogging. However, I haven’t tried any of the remaining in your list. But learning what their functions are made me realize that they deserve to be favorites. I would give time to add them all. Thanks for the sharing! Nice list. Cant get an AJAX plugin that actually loads the comment though..
does anyone knows side panel plugin for comment ? I would suggest trading out the long-time-unsupported “Reply with comment” with the very stable “Reply me” plugin. However, its worth noting that WordPress Thread Comment has its own tool for the same thing built in (but not enabled by default) and if the user is using that plugin should not use other plugins of the same type. Thanks for the very informative article… now i can protect my blog from spammers! Cheers!! !